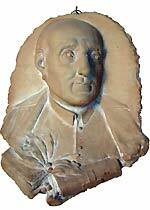 Ignazio Eustachio Capizzi was born in Bronte on September 20th, 1708, son of a shepherd and a wool spinner. Of humble origins, he became orphan of father and, when he was only eight years old, was looking after some sheep and lambs for his uncle's herd. At 11 years, still illiterate, began the first studies in Bronte, in the Oratory of S Filippo Neri, annexed to the Catena church, under the guidance of two priests and, with extreme sacrifices, continued them first in Caltagirone and then at Lipari. When he was eighteen, to continue the studies of philosophy and theology in the Eolean islands, he worked as a servant (room chierico), for the Bishop Of Lipari. Then, in 1732 moved to Palermo and worked as a scullery boy and a nurse in the Grand and New Hospital, and started to study medicine and, in 1734, embraces the medical profession but his dream is to become a priest. He continues in Palermo the religious studies and, after years of privations, humiliations and sacrifices, in 1735 in the Maximum College Of Palermo he gets the degree in Theology, on December 17 is ordered deacon and, at 28 year of age, in May 1736, finally he reaches priesthood. He was a truly virtuous man, charitable, devoted to poverty, always humble and showing a multiform apostolic zeal. Tireless, cultured preacher and writer, he dedicated big part of his life to help the sick and poor people and the neglected youth ignorant and guideless. Many Sicilian country towns and especially Palermo and Bronte, were witnesses of his fecund, apostolic activity and bold social initiatives as the building of public advantage works (colleges, boarding schools, institutes). 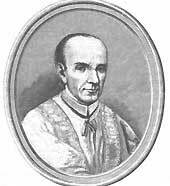 In few decades he becomes the tireless Palermo's apostle: in 1747 he builds the college of the virgins of Holy Maria Of The Carmine (destined to kindergarten the "unsafe girls"); builds an analogous college in Vicari; buys the oratory in the Teatini house and restores it; director of the Sapienza College (one of Maria's two risen colleges in Paler­mo), he enlarges it and restores it; enlarges and improves the girls' Reclusorio of the Hospital In Palermo; he organizes help to the dying and the convicts. In 45 years of fecund apostolate, he left memories of holinesses and prodigies also in Monreale, Nicosia, Castelvetrano, Messina, Leonforte, Alimena, Resuttana, and many other centers of Sicily. At Palermo, while in contact with colleges and scholastic institutes gets the idea to found a school for the formations of secular boys, but also new priests, in his native country town, with no schools and in nearly in total illiteracy. In Bronte whoever wanted to get an education had to leave his country town. His idea, few years later, was followed by Donna Maria Scafiti with the institution of the Collegio di Maria (1780) for girls and by Pietro Graziano Calanna who founded the "Royal Public Schools for maidens of Bronte" (1823). Ignazio Capizzi, poor, humble but highly cultured and a great organizer, conceived and built the majestic "Capizzi College" during few years. 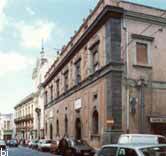 Ignazio Capizzi, poor, humble but cultured and great organizer, conceived and built the majestic "Capizzi College" during few years. The 25/6/1771 he selects the space where to build it, right in the center of town (San Rocco), and two years later he buys the land. Then sends the priest Marvuglia, architect of the Palermo Council to prepare the project and the 1st of May 1774 he blesses and puts the first stone. The construction activity lasted till 1778 and then finally on the 15th of October was celebrated the solemn opening of the school that eventually acquired so much importance and fame especially in Sicily and Southern Italy. In Bronte, the country town in which he was born and that he had left to get an education, he and built the majestic college, for the formation of secular boys but also new priests. To realize the work he had to overcome ironies and a great deal of difficulties, ostracisms, contrasts and calumnies of every kind; he went begging for the necessary resources everywhere. "Many gentlemen of Palermo, who admired him very much, gave him large sums, ..."
"the wealthy in Bronte and in the near country towns contributed generously to the construction. The priests, the nobles, all the people, when requested, helped to carry, stones and every other material on their shoulders". (G. De Luca, History of the town of Bronte). "The good old man, with sledgehammer in hand, break very hard boulders, or, with hoes take off earth, or help to carry beams or take out rubble and sometimes sweep the corridors sprinkling them with water that he had been drawing from the cistern, and that was not happening only sometimes, but fairly often, making him sweat profusely". 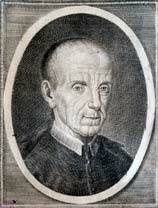 Ignazio Capizzi did not limit himself to the constriction of the college. He disciplined the studies, the director's election, the teachers' salaries, the duties and the obligations of teachers', of boarding school members and of all the students in general. Such rules governed the college for about a century and a half. 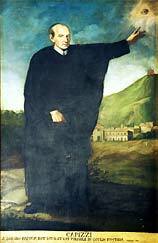 Ignazio Capizzi in some representations preser­ved in the Real Collegio Capizzi. The incision in the upper right corner (Sac. Ignatij Capizzi - Vera effiges) is taken from the book written by Michele De Albo and published just three years after his death. The other recor­ding is taken from the "History of the City of Bronte" by G. De Luca, 1883). The full-length picture (oil on canvas of 207 cm by 121) is from the end of 1700. On the right in the middle is the original project of the College, at the foot of the Etna smoking, and the words «Capizzi / to Domino factum est istud, et est mirabile in oculis nostris. Psalm [---] 117». The bust is work of the roman sculptor Michele Spina and was realized in 1883 celebrating the 1° centenarian of the death of the Venerable. The principal prospect of the Real Capizzi College: On the right the most ancient monumental part. The humble Ignazio Capizzi central figure in the pictu­re by Agostino Attinà "Uomini illustri di Bronte" (Bronte’s il­lustrious men). In his mythical ascent to the wooded Par­nassus, Ignazio receives from the Archangel (and not from the Muse) a victory ‘s laurel crown for the many merits of virtue and sanctity obtained during all his life. On the left there is Mount Etna that dominates Bronte and “the Royal Public Schools” by him wanted and founded, placed at the centre amongst Churches and Convents. The college, wanted by the humble priest Capizzi, is considered, to a good reason, a truly big glory for Bronte, that has been put, at least in the last two centuries, in a position of safe pre-eminence compared to other centers of eastern Sicily (in a parliamentary session of 1885, Ruggero Borghi defined the Capizzi College "forum of the Latin language"). 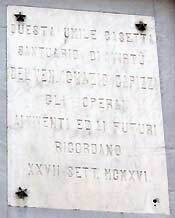 Ignazio Capizzi died in the Olivella convent In Palermo on Sep­tem­ber 27th, 1783, where he was buried and then laid down in the Church Della Sapienza. Before dying, in August, it sent all his valued books to the Library Of The college with the express commandment that should be opened for usefulness of the audience. His mortal remains were moved to Bronte and from the 17 April 1994 rest in his College, in the Church Of the Sacred Heart. The funeral monument placed on the left nave was made by the sculptor Ivo Celeschi. 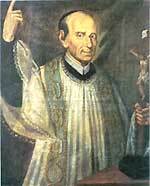 Ten years after his death, in 1793, in Bronte and in Palermo, was instituted the ordinary process for the beatification of the humble priest. The documentation, sent in Rome in 1808, is favorably accepted in 1817 by the Congregation Of The Rites. 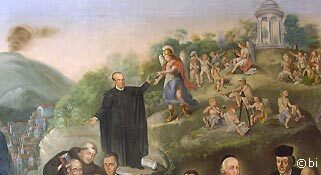 For his theological virtues and the fecund apostolate, on May 27th, 1858, Ignazio Capizzi was declared venerable from Pius IX, that called him the San Filippo Neri of Sicily. 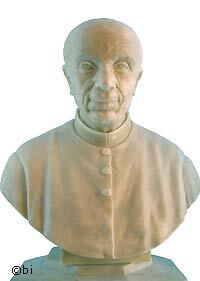 The cause of his beatification is still going. 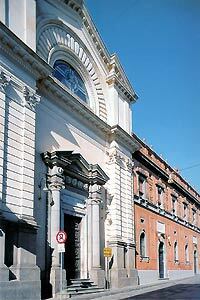 The church of the Sacro Cuore (Sacred Heart) preserves the mortal remains of the Venerable. Ignazio Capizzi, moved to Bronte In April 1994. 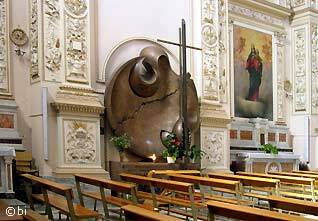 The funeral monument, a sculpture work by Ivo Celeschi (1993), was given by an ex-boarding school student of the Capizzi College (on. Marcello Dell' Utri, Gruppo Fininvest). 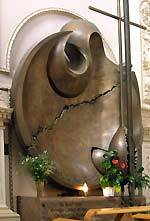 The sculpture that dominates the small tomb of the venerable represents the way in which, torn by marginalization, injustices, violence, from an open seed, can sprout and rise a high cross, sign of hope and justice. The writing at the base says: "Bronte - al fondatore del Real Collegio che del suo nome si fregia - A. D. 1993" (Bronte to the founder of the Real College that bears his name).